The former Liverpool and Real Madrid striker has claimed the Foxes forward is lucky in front of goal, but the England international is paying little attention. LEICESTER CITY STAR Jamie Vardy is not paying attention to his critics after Michael Owen claimed the Englishman’s goalscoring feats relied a lot on luck. For the first time in 16 matches, Vardy scored on Saturday — and he did so in style, netting a hat-trick as Premier League champions Leicester stunned Manchester City 4-2. Last month, former Manchester United, Real Madrid, Liverpool and England striker Owen said Vardy is not a natural finisher. Responding to Owen and others, Vardy — who scored 24 Premier League goal last season — said: “I don’t listen to that. He can say what he wants. Everyone is entitled to their own opinion. The win at home to City ended a five-match winless streak for Leicester, who are four points clear of the relegation zone. 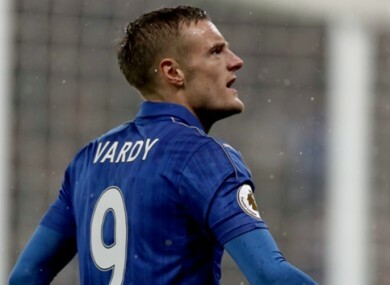 Vardy added: “At the end of the day the team comes first. Although we’ve not been getting the results and a few of the performances have been below par, deep down we knew we were still the team we were last year. On Saturday’s performance we’ve definitely got that back and we’ll look forward to Tuesday now at Bournemouth. “I don’t think we can start talking about streaks and stuff like that just yet, but we’ll have to wait and see. Email “'He can say what he wants' - Jamie Vardy responds to Michael Owen criticism”. Feedback on “'He can say what he wants' - Jamie Vardy responds to Michael Owen criticism”.